The professionals at Morris-Depew Associates would like to thank all of our friends and colleagues for their support of our business over the past year. As we get ready for the Holiday Season, we would like to remind everyone our offices will be closed December 25th and will reopen January 2nd, 2017. We wish you and your family a Happy Holiday Season! 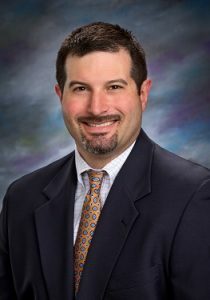 Morris-Depew & Associates would like to introduce our new Assistant Director of Surveying, Donald Miller, PSM! Don has over 30 years of experience in many facets of surveying including, boundary surveys, topographic surveys, platting, condominiums, ALTA land title surveys, coastal surveying, FEMA flood, first order control surveying and construction layout of residential, commercial and industrial. Don has coordinated multiple survey crews for large scale projects such as commercial retail centers, hospitals, roadways, sports stadiums, oil refineries, pipe lines and race tracks. He also has vast experience with new residential projects from development to a final survey. Don lives in Fort Myers with his wife Tami and their three dogs. Supporting the reconceived TPI Hospitality resort development proposed near Times Square in the heart of, The Town of Fort Myers Beach, Morris-Depew Associates is providing a complete development package that includes Planning, Engineering, Surveying, & Landscape Architecture services. Planning services being provided by, Planning Director, Tina Ekblad, MPA, AICP, LEED® AP, include a detailed Commercial Planned Development application that brings together over 6-acres into one unified development scheme. The proposed development includes a resort hotel with a centrally located pool and lounge area, beachside social venue, dining and entertainment opportunities, and a public beach access with parking. The resort development is being supported by John Hafner and Adam Olson at Cities Edge Architects, Amanda Brock and Russell Schropp at Henderson, Franklin, Starnes & Holt, PA, Stephen Leung at David Plummer & Associates, Inc., Matthew Simmons and Matthew Caldwell at Maxwell, Hendry & Simmons, LLC. Other members of the Morris-Depew team are supporting the project through stormwater management and engineering design provided by Vice President, Bill Morris, PE, LEED® AP, and Project Engineer, Stephen VerVaecke. Surveying services provided by Vice President of Surveying, Mark Hatfield, PSM, as well as, landscape architecture and graphic support provided by Director of Landscape Architecture, Michael Ekblad, PLA. The perspectives illustrations, site plan, and birds-eye overview, provide a visual example of the proposed development and support the various public input sessions and media announcements. Please view the News-Press article featuring the Times Square Resorts Illustrations prepared by Michael Ekblad. Our design team consisting of Vice President and Project Manager, Bill Morris, PE, LEED® AP, Planning Director, Tina Ekblad, MPA, AICP, LEED® AP, Director of Landscape Architecture, Michael Ekblad, PLA, and Vice President of Surveying, Mark Hatfield, PSM are currently working on the next expansion of the Gulf Coast Medical Center campus on a larger project team headed by HKS Architects and includes MEP Engineering firm WSP+CCRD and structural engineers with TRC Worldwide Engineering, along with construction manager Skanska-Gates, garage developer Finfrock, and Lee Health staff to develop the site design that efficiently utilizes the available space on the campus with an emphasis on ease of access and pedestrian safety. Morris-Depew is providing Site and Landscaping Design, including upgrades in water and sewer capacity for the expanding needs of the facility. Construction Documents for the Second Phase of the expansion project scope are nearing completion. At build out, the project will include an additional three-stories to the existing patientConstruction Documents for the Second Phase of the expansion project scope are nearing completion. 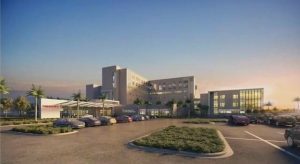 At build out, the project will include an additional three-stories to the existing patient towers, accommodating an additional 268 beds, which expands the facility capacity to 624 beds. The increased number of beds will radically maximize the size of the Emergency Room facilities to accommodate the relocation of the Trauma Center. With the final completion of the expansion scheduled in 2020, the First Phase authorized by Lee Health brought additional surface parking to the campus and was completed in September. This improvement allowed construction to commence on a new six-story parking garage providing almost 1,300 spaces to considerably expand parking availability and provide staging of construction efforts for later phases of the project. Morris-Depew Associates is also providing is construction staking of the proposed improvements to be performed by our Surveying Department under the direction of our Assistant Survey Director, Donald Miller, PSM. The Governor and Cabinet, sitting as the Administration Commission has upheld Lee County’s approval of the River Hall comprehensive plan amendment. 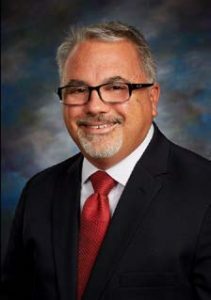 President, David W. Depew, PhD, AICP, LEED®AP and Planning Director, Tina Ekblad, MPA, AICP, LEED® AP, assisted Russell Schropp, Esq, of Henderson, Franklin, Starnes & Holt, PA, in defending the County’s actions on behalf of GreenPointe Communities, LLC. The Administration Commission concluded the Petitioners failed to prove beyond fair debate the Plan Amendment and Policy are internally inconsistent. The Commission also concluded the Petitioners failed to show the Plan Amendment was not in compliance with Chapter 163, Florida Statutes. First begun in 2012, the applications to make River Hall one of Lee County’s premier luxury residential communities can now move forward. President, David W. Depew, PhD, AICP, LEED®, AP, and Vice President, Bill Morris, PE, LEED® AP, provided extensive assistance to Walton County’s special counsels, Larry Sellers and Nathan Adams, of Holland & Knight, LLP, in defense of a challenge to the Walton County Comprehensive Plan amendments involving Walton County’s unique dune lakes. Walton County’s plan amendments were challenged by 1000 Friends of Florida, alleging that the proposed amendments were not supported by data and analysis, created internal inconsistencies, and failed to adequately protect natural resources. 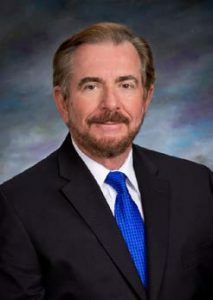 While David Depew, worked on the data and analysis provided in support of the amendments and the types of protections provided in other jurisdictions, Bill Morris, worked to analyze water quality issues and pollutant loadings generated by development across the 15 existing dune lakes in South Walton County. Ultimately, a mediated settlement was reached in the case, based in part on the work provided by Morris-Depew Associates, and the parties working together for the protection of these unique natural resources. 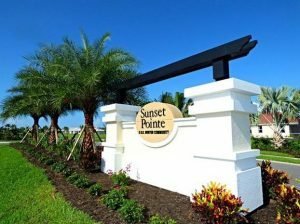 Construction was completed on the development of a 20-acre, 57-unit single-family residential development in Southwest Cape Coral. Developed by, D R Horton for which Morris-Depew Associates provided Land Use Planning, Civil Engineering, Landscape Architecture and Land Surveying services. Vice President, Bill Morris, PE, LEED® AP, Planning Director, Tina Ekblad, MPA, AICP, LEED® AP, Director of Landscape Architecture Michael Ekblad, PLA, and Vice President of Surveying, Mark Hatfield, PSM, teamed with legal counsel Amanda Brock, from Henderson, Franklin, Starnes & Holt, PA to procure approvals of the Planned Development Project (PDP), and Site Plan from the City of Cape Coral, as well as, an Environmental Resource Permit from the South Florida Water Management District. The Landscape Architecture department at Morris-Depew Associates completed the design and permitting for the new Scan Design of Fort Myers located at the northeast corner of the intersection of Metro & Daniels Pkwy. 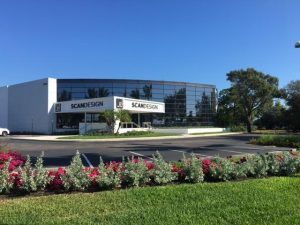 Director of Landscape Architecture, Michael Ekblad, PLA worked with Preben Knudsen, one of the founders of Scan Design of Fort Myers, and Rick Kruszewski, Project Manager for Sunnygrove Landscaping to create a planting plan compliments the high-end contemporary furniture and home décor offered at Scan Design. Project services also included conceptual design, construction related services, and successful abatement of code violations. 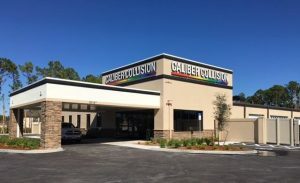 Construction has been completed for a new Caliber Collision Auto Body Repair and Paint Shop located in Bonita Springs. The project, constructed by GCM Contracting Solutions, Inc., commenced in April of 2016 and was completed in November of 2016. Morris-Depew Associates provided site surveying services, civil engineering design and permitting services as well as landscape architecture and construction layout. Professional engineering and design services by Vice President, Ryan Shute, PE and Project Engineer, Stephen VerVaecke. Landscape Architecture services were provided by Director of Landscape Architecture, Michael Ekblad, PLA and Surveying services were managed by Vice President of Surveying, Mark Hatfield, PSM. The project will feature a 18,000 square foot building for car service and commercial space within a 4-acre site. As a longtime supporter of Abuse Counseling & Treatment, Morris-Depew Associates has partnered with ACT to accomplish many goals. 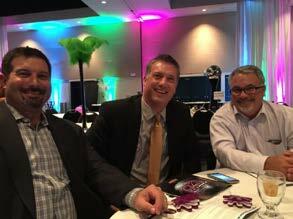 This year, in addition to assisting with a review of the permitting and site design of the current ACT facility, Morris-Depew Associates participated in A Night at the Disco, the annual Arts for ACT Fundraising Gala. Vice President, Bill Morris, PE, LEED® AP and Katie Morris joined Planning Director, Tina Ekblad, MPA, AICP, LEED® AP, and Director of Landscape Architecture, Michael Ekblad, PLA, Project Manager, Kendrick Gallander, Assistant Survey Director, Donald Miller, PSM, and Matthew Simmons from Maxwell, Hendry & Simmons, LLC and Alicia Simmons from Youth Haven at this year’s gala. 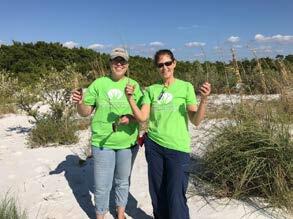 Morris-Depew Associates, Landscape Designer, Elizabeth Prugh and Receptionist, Hailey Underwood participated in a service project hosted by ULI SW Florida and Keep Lee County Beautiful at Lovers Key State Park. The event planted over 2,500 Sea Oat Grass plugs to support Dune and Beach restoration. 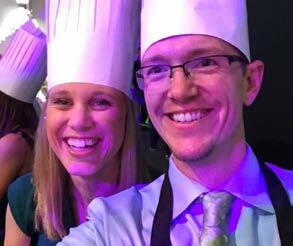 Planning Director, Tina Ekblad, MPA, AICP, LEED® AP, and Director of Landscape Architecture, Michael Ekblad, PLA attended A Night in Bangkok, the annual, Cooking for the Arts benefit event supporting The Sidney & Berne Davis Art Center. The Ekblad’s joined members of Henderson, Franklin, Starnes & Holt, PA, Russell Schropp, Esq, and Molly Maggianno, Esq, and their guests Barbara Schropp, Grady Miars of GreenPointe Communities, LLC, and Farzaneh Kazemi and Saeed Kazemi, PE, of The City of Fort Myers.